Review: Oh what a fab fab read! This book may come in a small package but it certainly packs a massive punch. I had no expectations going into this book, which i think is the best way sometimes don't you? I sat down with a glass of wine and this in my hand and i didn't get up until i had finished both. (This is the perfect length of book for a large glass of red by the way). This book has all the feels. I loved Nell, she really blossomed over the 95 pages of this cute little novella and i had completely fallen in love with her by the end. Her confidence and self-belief grew and she learned how to have fun and be spontaneous. This book has romance and laughs, a little bit of sorrow and the beautifully described city of Paris. I loved the descriptions of zooming around Paris on a moped, no detail is left out , despite the short length of this novella. The wine and the coffee sounded amazing so i really do defy you not to at least want a croissant whilst reading this delightful little offering. There were also parts which made me laugh, Nell's friends and her American nemesis provide the laughs in spades and along with the aw factor, the writing style was wholly satisfying|! There are two possible suitors for Nell's heart and the French one of those two will definitely melt your own heart and he's a writer too. They've both been hurt and so you know that makes for the best kind of will they won't they situation. because Nell is only in Paris for a couple of nights, her trip is a short as the book and so you are definitely left wanting more. 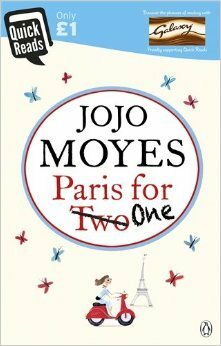 This ends on a delightful cliffhanger and i so so want to find out from Jojo Moyes exactly what happen next...like now! This sounds like a lovely read. But probably one that would make me want to take a trip to Paris!